The brief for this project was to update three rooms but to link them all with a cohesive style that would allow a better flow to the space. The plan was to add new furnishings and accessories in a new colour scheme. 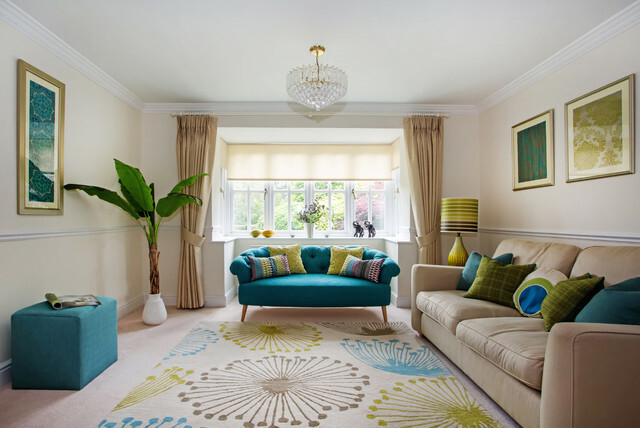 Although new sofas, chairs and accessories were added, bookcases and tables were up-cycled and given a new lease of life as well as bespoke lampshades and cushions created for the scheme. It was by Sanderson and called Dandelion... it's still available I think! rug - hello where can i buy the rug..it's beautiful. It's by Sanderson and called 'Dandelion clocks'- I'm not sure if it's still available. A curved back love seat in the bay window and a couch along the wall in a different color/texture would look great. The colors and the house structure looks as ours so it is easy to imagine to decorate the house.